8/7/2009–Hillsborough, NC–C/1st Lt Daniel Kong was promoted to C/Capt and earned his Earhart certificate from Wing Commander, Col. Roy Douglass on Tuesday, August 4th, 2009. The promotion ceremony was performed at the Orange County Rescue Squad building located in Hillsborough, NC. The Rescue Squad is also home to the Orange County Composite Squadron, NC 150. C/Capt Kong, age 16, has been a CAP cadet since joining at age 12. He currently serves as the Cadet Commander for Orange County Composite Squadron and the Chairman of the North Carolina Wing Cadet Advisory Council. He attended Cadet Officer School at Maxwell AFB last month. Other noteworthy CAP achievements include participating at National Cadet Competition as a member of the MER color guard in 2008, and attending the rigorous Cadet Survival School in California Wing. 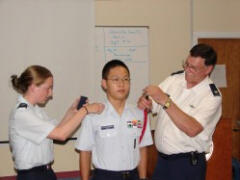 Outside of Civil Air Patrol, C/Capt Kong is a straight A student at East Chapel Hill High School. He runs cross country and track, plays in the band and is also the captain of the math team. He is also a Boy Scout with Troop 39 in Chapel Hill and achieved the rank of Eagle Scout earlier this year.